Feinberg students, residents and fellows are doing some extraordinary things in the clinical spaces, research labs and out in the community. Here we share internal and external recognition they have received. For all the news on Feinberg discoveries and campus activity, visit our News Center. Oluwaferanmi Okanlami, MD, MS, shared perspectives on disability in medicine and promoting a more inclusive and accessible health system during the Spring Diversity and Inclusion Lyceum Lecture. Jordan Rook, a fourth-year student, measured medical students’ views on healthcare reform and political engagement, publishing the findings in the journal Academic Medicine. 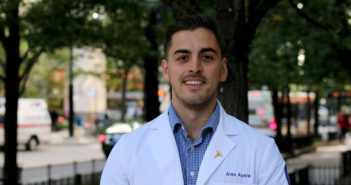 Robert Riestenberg, a third-year medical student, was the first author of a recent study that evaluated statin use among people with HIV, a population at an increased risk for cardiovascular disease. At Feinberg’s annual Second Look event, admitted students get a taste of life at Feinberg by attending seminars, touring campus and meeting with current students and faculty. 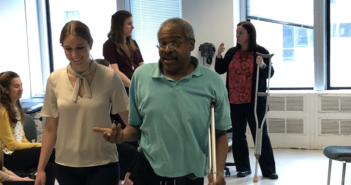 Nearly 100 second-year Doctor of Physical Therapy students recently participated in learning experience with volunteer community members and Northwestern faculty members. Andrew Furman, a third-year student in the MD-MBA dual-degree program, has worked with Erie Family Health Centers as part of his participation in Second Opinions, a pro-bono healthcare consulting student organization. In a recent lecture, Dana Thompson, MD, MS, chief of Pediatric Otolaryngology, discussed the negative impacts of implicit and explicit bias on healthcare teams and shared strategies to effectively manage instances of bias. On Match Day, fourth-year medical students learned where they will spend the next phase of their medical careers. Forty new members were inducted into Northwestern’s chapter of the Alpha Omega Alpha medical honor society during a ceremony on March 12. In the Education-Centered Medical Home program, Feinberg students learn to provide primary care to vulnerable populations living in Chicago. 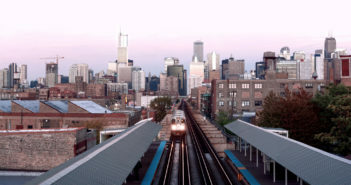 Jacob Pierce, a third-year student in Northwestern’s MD/MPH Combined Degree Program, is the first author of a study that found adverse childhood experiences significantly increase the risk for heart attack and stroke later in life. 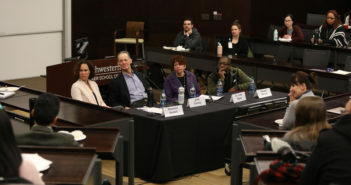 During the week after the eponymous holiday, Northwestern hosted a series of panel discussions, documentary screenings, service activities and a student oratorical contest. Kelly Wun, a fourth-year medical student, was the first author of a study that links the microbiome to the development of restenosis, the renarrowing of arteries after a procedure. 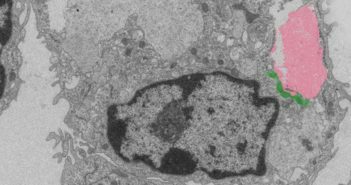 Northwestern Medicine scientists have identified a gene, called isocitrate dehydrogenase 3-alpha, that promotes tumors in grade IV glioblastoma, according to a study published in Science Advances. Medical student Liam Kane discusses his orthopaedic surgery research fellowship, his interest in global health and what he loves about Feinberg. Northwestern Medicine scientists have discovered a novel signaling pathway that promotes healing and tissue repair after heart attack, in a study published in Cell Metabolism. Northwestern scientists specializing in HIV and AIDS gathered to share their experiences during a panel held December 3, to commemorate World AIDS Day. The 40th performance of In Vivo, Feinberg students’ annual sketch comedy and variety show, raised money for a Chicago-area charity that helps homeless women. Patricia Garcia, MD, MPH, ’91 GME, associate dean for curriculum, discussed the use of augmented, virtual and mixed reality in medical education during a recent Today’s Innovations in Medical Education lecture. Bettina Cheung, a student in the Medical Scientist Training Program, brings her passion for music to medicine with the Northwestern Medical Orchestra. 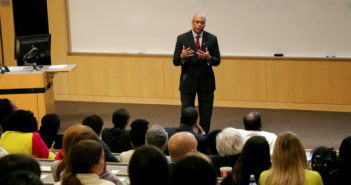 A recent lecture by Quinn Capers IV, MD, associate dean for admissions at the Ohio State University College of Medicine, discussed how to reduce implicit race and gender bias in healthcare and medical school admissions. The inaugural Women in Medicine Symposium brought together faculty, scientists, trainees and students to highlight achievements of women faculty and identify ongoing challenges in career development. Maya Jackson-Gibson, a second-year medical student, is a leader in the groups Medical Students for Choice and the Student National Medical Association. Prospective students of the Feinberg School of Medicine (those who have either interviewed or have been invited to interview) receive an exclusive monthly e-newsletter from the Office of Admissions, called Feinberg 411.